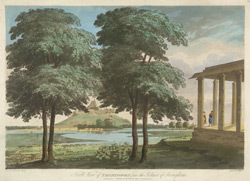 Coloured aquatint of a northern view of Tiruchirappalli from the island of Srirangam in Tamil Nadu by John Wells (fl.1792-1809) after an original drawing by Captain Elisha Trapaud (1750-1828) and dated 1788. The site of Tiruchirapalli, has been an important Hindu centre since Chola times thanks to a huge granite rock that rises steeply above the Cauvery river. Significant structures on the rock include two Shiva santuaries. The lower of the two dates from the eighth century and consists of a columned hall with two side shrines. They have carvings of Hindu deities typically seen in Pandya art. In the 17th century, the Nayakas dynasty built a fort on the rock but only a fragment of this structure survives. Srirangam island is situated to the north of the town of Tiruchirapalli on the Cauvery river. It is the location of two large temple complexes. The great Vaishnava sanctuary dedicated to Ranganatha was founded during the Chola period and was later enlarged under the patronage of the Vijayanagara and Nayaka rulers in the 16th-17th centuries. To the east is the Jambukeshvara, a Shiva sanctuary built in the 17th century in the Nayaka period.